I’m not sure what you’re accusing Andy of, here, since I’m the one who behaved badly. I’d also note that I’ve acknowledged that I behaved badly, publicly apologized for same, and tried to correct my ignorance. And that you know I’ve done the above, as you came to comment on my blog, further chiding me for behaving badly. I’m not sure what more you want of me. Public self-immolation? The sarcastic tone of Andy’s initial tweet is what instigated the whole conversation, the duration of which Andy spent openly admitting that he didn’t know what he was talking about, but he still judged those librarians who were passionate about the topic. That behavior on his part definitely seemed to fly in the face of his Big Tent Librarianship stance. If he truly believed in the Big Tent philosophy, he would have tried to gain understanding before making his snappy comment, and never have given rise to your bunhead insult. So in my opinion, it begins and ends with Andy. This isn’t the only time he’s been seen by certain areas of the library community as tearing down rather than building up, so I don’t think anyone should assume all of this response is solely for on incident. Andy has a pattern than we’re trying to break, and other people have been caught in the cross-fire, for good or ill. I don’t apologize for the chiding. Some people on the other side of the argument deserve reproach as well. 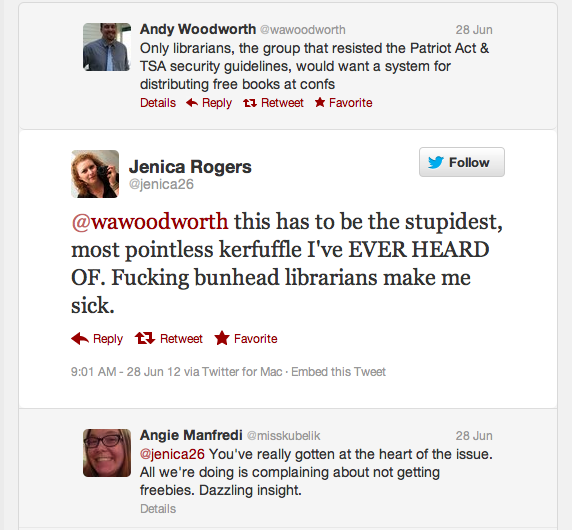 It’s no longer about the issue itself, it is about how we, as fellow librarians, talked about it with each other. I appreciate your apology and your willingness to converse, but I am sorry that you still don’t seem to understand the issue. Replace “ARCgate” with a subject that you’re passionate about, perhaps, and see how the tone of the discourse makes you feel. That is what I am getting at. I hope in the future we can continue the dialogue in a true Big Tent fashion. I truly do admire and respect you, Jenica, and that is why I felt it was the right thing to engage with you directly via your blog, rather than dancing around the issue in other channels. I hope that comes through.